A good part of the discussion on the advantages of inflating tires with Nitrogen focuses on stable inflation pressure which seems to be of concern to some. Now for race car application this is important and the benefits are meaningful in that application but I do not think that a fluctuation of a few psi due to temperature variation is meaningful in normal highway use. Measurable but not meaningful. I can accept the fact that no matter what my opinion is, some will still argue that stable tire pressure is desirable, so they feel the expense and complications of using Nitrogen are worth the cost. While there are some theoretical advantages to inflating tires with a gas that is low on oxygen, I don't think they are worth the effort. I have both Argon and a mix of Argon and CO2 available to me in my shop but I still use regular air from my compressor. The one thing I do have with the air in my compressor is the knowledge that the moisture level is low, as I have filters and water separators in my system. But what do you do if you don't have a well equipped shop in your back yard but still want dry air? I am going to show you a set-up I have, that costs about $20 and can be used to inflate your tires for years to come. Above is a small air drier system I use in my shop for some special equipment that needs especially dry air, you can duplicate it to ensure the air you are using to inflate your tires is dry. The dryer is available at 2/$20 at WW Grainger as well as $8 ea at Advance Auto. Be sure the one you buy is rated for the air pressure you need. Harbor Freight units are rated only 95 psi. •Quick connector set is $5 a set or less at Harbor freight. Note my four year old desiccant is purple not blue so I am getting close to needing to change the dryer which is a disposable unit. To help keep your dryer from getting old fast, keep it tightly sealed in a good zip-lock bag or some container with air tight top as I do. There are too many individual air setups for me to identify all the possibilities but this simple dryer will deliver what you need. Warning. If you are going to try and "dry out" the air in your tires by changing your "wet" air you need to jack up the tire so it is not contacting the ground. If you let air out don't go too low or you may have problems with losing the seal at the bead. A quick test to see if you have lots of moisture in your inflation air is to remove the valve core. If water spits out you have excess moisture in the tire. You may even need a tire store to service it to get the excess moisture out. Hope this will save money for those wanting dryer air in their tires. I get asked that question. This can get technical so if you don't want to get bogged down, the answer is - IR guns are OK for metal objects or for surfaces with uniform temperatures but not for getting accurate tire tread area temperatures. Now for those that want the details. I see some who claim on RV forums that the guns are a good tool to help determine the proper tire inflation for their RV. I own an infrared (IR) gun I got from our favorite cheap tool store, Harbor Freight. So you might expect I use it all the time. While I did use the gun for my Tire Cover Test, I have only used it once on my tires and that was during my study to collect data so I could offer this observation on using IR guns for monitoring tire temperatures. During my career as tire engineer I have used needle probes on Indy racing tires for drivers like Mario Andretti and Al Unser. These probes were designed to penetrate into the tire to the top of the body cord which is the hottest location. If I did not probe deep enough I would get a misleading low temperature. An error of just a few degrees could be critical. 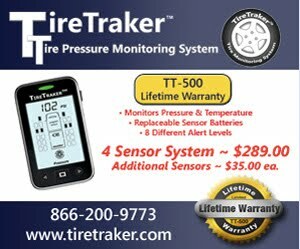 I have also been involved with the use of thermal imaging systems costing tens of thousands of dollars, to conduct tire design tests, so I know from personal experience that they can provide information on the operating temperature of a tire under load and at speed. What I also know is that different parts of a tire can have a very large temperature variation. If a tire is going to fail or be damaged due to excess heat, it is not the average temperature of a tire but the temperature of the hottest spot that may cause the damage. To help you understand what I am talking about let’s look at some thermal images captured by a laboratory quality IR system. These images are from a book “The Pneumatic Tire” by Gent & Walters, distributed by NHTSA in 2006. The 707 page book is aimed at tire engineers and chemists, so it is definitely not a quick read while at your campsite. While I did consult a very little bit with a couple of the engineers and scientists that contributed to its writing, the majority of this information came from very experienced members of the tire industry community, some of whom worked for different major tire companies and others who have PhD’s in their field and others who teach college and graduate level chemistry or tire mechanics courses. These guys know their stuff. IN THIS SERIES OF IMAGES, you can see the variation in temperature both with inflation level and across various portions of the tire being tested. I have added yellow circles approximately ½” diameter. I think you can see that it is essentially impossible to find a uniform temperature over such an area especially when increased temperature differential becomes more important. The lab IR equipment has a very high resolution which means it can differentiate temperatures across very small areas, 0.10” or smaller. To help, green is 90°F and white, or hottest, is 140°F. It is important to also remember that rubber is a good insulator and does not transfer heat rapidly, so it takes minutes at a constant load and speed for the higher temperatures generated deep within the tire structure to migrate and stabilize at its surface which is constantly being cooled by the surface air. You should note that different portions of the tread pattern have very significantly differences in temperature with the highest temperatures deep down in the bottom of the grooves, slots and sipes of the pattern. To obtain these higher temperature readings it is necessary for the IR sensor to “see” down into these tread pattern features while also not including the much cooler temperatures only 0.10” to 0.25” away and to be able to record the temperature while the tire is running. It is also important to notice that as you move away from the tread pattern and down to the smoother sidewall, the temperature gets much cooler. So if you try and use your hand held gun on a more temperature uniform portion of the tire you will no longer be reading the hot locations. IF YOU HAVE USED YOUR HAND HELD IR GUN to learn the temperature of your tires, I think you can see that you have been mislead, as the area used to sense the surface temperature was too large to capture just the hot area in the tread area, or you targeted the more uniform but much cooler sidewall of the tire. In either case your readings do not provide a reliable or sufficiently accurate reading to be used for tire inflation setting measurement. I am sure that some still think that they have made the effort to be very precise when taking temperature readings. They always shot the exact same location (i.e. the same tire lug for they vary in size and therefore vary in temperature) on each tire, were only a ½” or less away from the tire surface to get the hot location in the bottom of a slot, and that the time to measure all their tires was always less than 30 seconds after stopping and always in the same sequence to address the surface cooling that all tires go through, or maybe not. So, in my next post, I will show the results and analysis of the test of pressure variation effect on temperature I ran with the manager of race tire development at a major tire company, who was gracious enough to assist me in doing a comparison of my TPMS that reads the contained air temperature (CAT) using a probe mounted inside the tire vs. a hand gun vs. his professional 0.1° F reading probe which gets into the rubber and provides a reading closer to the source of the temperature.